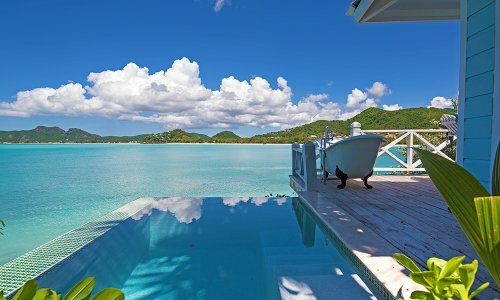 Antigua all inclusive resorts are of good quality but what really makes a Antigua a standout is the natural beauty. They say there is a beach for each day of the year with 365 of different shades of pink and white ones. Just below is our recommended list of resorts - starting with the best first. But please also familiarize yourself with the video, images and best time to visit Antigua before you book. 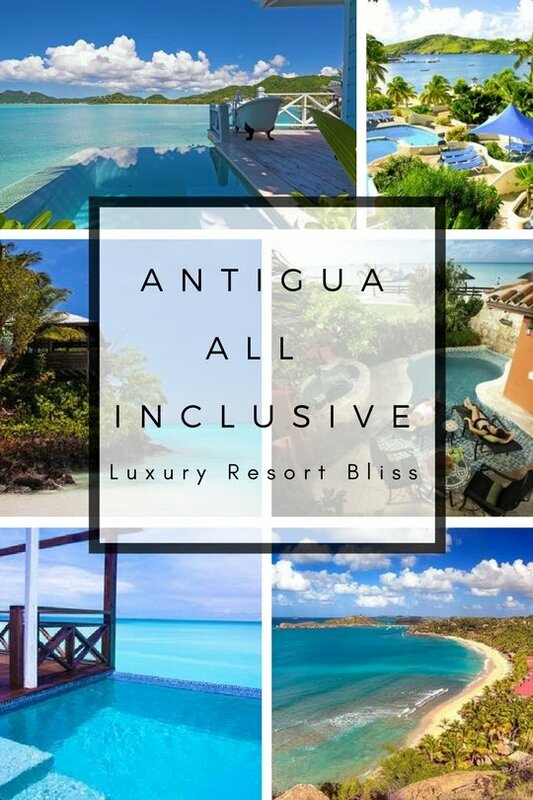 Lucky for you, the best resorts in Antigua are often all inclusive. Wouldn't you love to vacation here? Location: Gingerbread wooden cottages on a plantation and sandy white beaches. The resort only accommodates about 80 couples, no children. A very relaxing vacation spot. Amenities: All inclusive three meals daily, non-motorized water sports, house brand drinks, towels, pools and spa tub, taxes. Pay extra for premium food and drinks, motorized water sports, spa treatments. 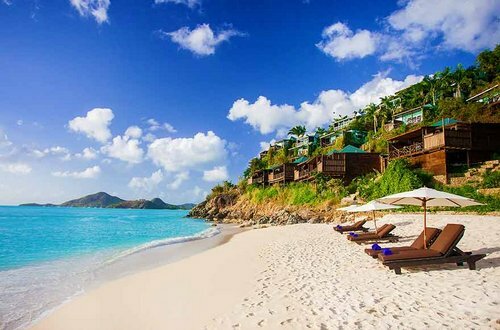 Location: Six kilometers from St. John's on a three-quarter mile stretch of Antigua's western coast. Rooms: 69 guestrooms and cottages between a bird-sanctuary lagoon and the beach. Amenities: An all-inclusive stay at this four star hotel includes air-conditioned accommodations, all meals, secluded bayside beach where you can go snorkeling or sailing swimming pool and fitness center, the beach side restaurant and 2 bars. Reviews: This is our top choice especially for those on a honeymoon. A cool cloth and offer of drinks on arrival, the friendly faces, maintained grounds, unpretentious peaceful elegance make this one a stand out. See the latest reviews here. Location: on private 100-acre estate overlooking Mamora Bay. 35 min from top golf course. Amenities: Five star all inclusive on white-sand beaches, with four outdoor pools, snorkeling, windsurfing, kayaking deep-sea fishing, six tennis courts and pro instructions, gym, salon and spa, daily activities programs and more. Rooms: have furnished balconies with ocean or garden views. Cable television, air conditioning, in-room safes and bathrobes. Reviews: A great resort for families with children or if you are on a honeymoon. Those on the Atlantic side enjoyed walking right out onto the beach. 2 beaches make room for all inclusive activities while keeping one for restful relaxation. 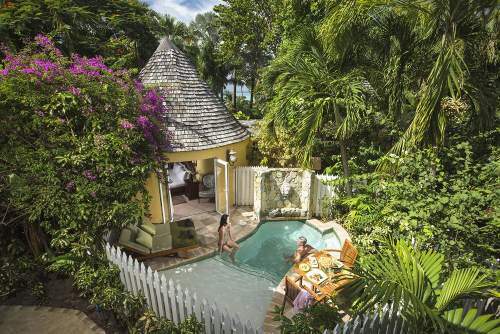 The resort has held it's own and remains among the best in Antigua for multiple years in a row. 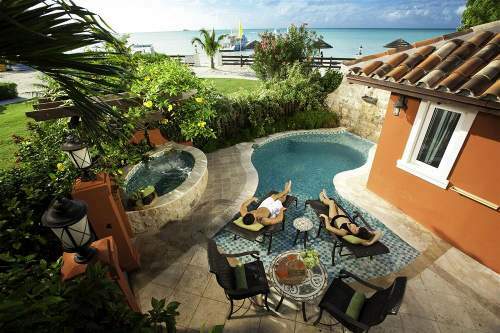 More information, reviews and offers on St. James's Hotel & Club Antigua All Inclusive Resorts. 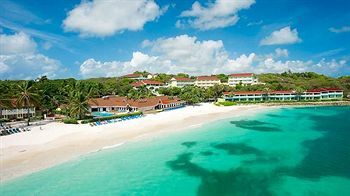 Location: Couples-only resort set on Dickenson Bay which has one awards for the worlds best honeymoon location (on the beach). Amenities:There are five freshwater pools, swim-up pool bar, five soothing whirlpools, six other bars, and four restaurants. There are a wide variety of activities included in the nightly rate. Rooms: have a king bed, ceiling fan and, a patio or balcony and mini refrigerators and are pure luxury to say the least. Reviews: The reviews were up and down for this resort a few years ago and the resort has improved vastly since our last review. For a resort with a big reputation this one does pretty well to live up to it overall. The swim up bar is a standout. Cocos Antigua All Inclusive Resort is not huge and actually only has 23 rooms. The resort is located in spectacular Valley Church and set in one of the most idealistic beach paradise imaginable. What it lacks in size it certainly makes up for in spectacular beaches and quality service. A nice poolside bar, spa facilities and creature comforts make this a good choice as represented in the high proportion of outstanding reviews it gets from guest who have previously stayed here. Included are meals and drinks at on site dining establishments and these generally come out on a plate rather than in a buffet setting. Taxes and gratuities were also included at the time of writing. While not a super luxury resort, we were immensely impressed by this resort on our last off all resorts in Antigua. Location: On 40 acres of gardens with exotic palm trees nine miles from the airport. Amenities: Four Restaurants - Caribbean, Italian, International and Beach Grill are on site. The resort also features five bars, including a swim-up bar, a spa, beauty salon and fitness center. Rooms: 464 air-conditioned rooms with TV have all inclusive packages which include KIDS club, taxes and gratuities. Reviews: Luxury Resort Bliss last looked at this resort in 2015 and at that stage it had failed to improve much or make substantial upgrades or improvements since our last visit. However the wealth of activities prove a winner for families with teenagers and young children and if you are looking for a larger upscale resort this is one of a few to choose from. 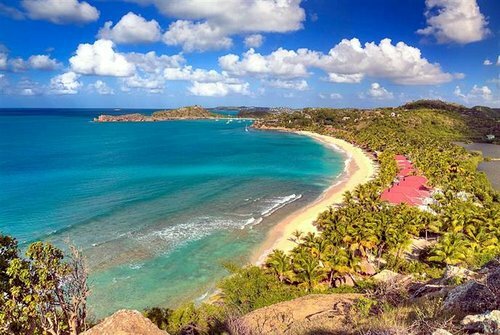 Location : This all inclusive resort is on a secluded stretch of beach along the east coast near St. John's and Devil's Bridge. Amenities: Barbecue and West Indian buffets, Italian cuisine and a Grill, six beaches, poolside bars, live entertainment. Leisure activities include an air-conditioned fitness center. The all-inclusive plan includes the use of windsurfers, Sunfish, Hobie Cat sailboats, kayaks and snorkeling gear and tennis courts. Rooms: 180 guestrooms in wooden buildings equipped with cable television. In-room safes are provided. Reviews: You get a lot for your dollar here. Spectacular views from any part of the resort. Staff are fantastic. Great romantic setting with few drawbacks. 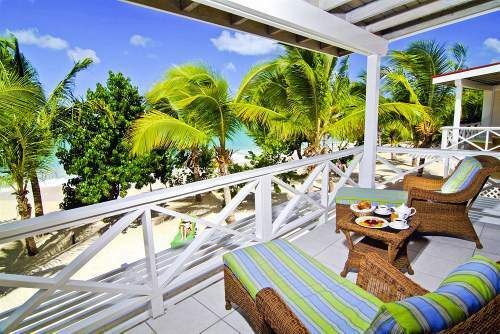 More information and latest reviews of Grand Pineapple Antigua Resort. 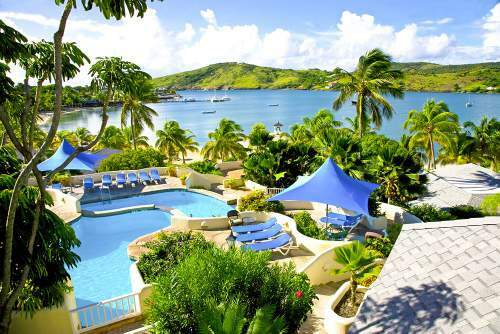 A top Antigua all inclusive resort which matches it with the best of them. What a wonderful spacious private beach located at Willikies. For a 3.5 star resort this property definitely punches above its weight and arguably deserves a higher star rating simply on quality. You will find a full spa and all the beach activities you would expect of an 180 room resort - like snorkeling and sailing. The complimentary children's club makes this an especially good choice for families. Find a resort that looks right for you? If you're still looking around, you can check out Antigua Resorts or Caribbean All Inclusive Resorts.